Here's the second step in homemade sausage production. You have your meat all nicely trimmed, it is cut up into workable sized chunks, and it's time to get it ready for seasoning by grinding it. It doesn't matter what kind of grinder you use. They all work basically the same, whether they are manual or power operated. Because this was a small batch of sausage, I decided to use the grinder attachment for my KitchenAid Mixer. 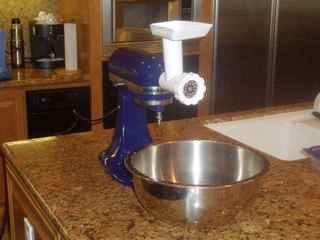 The KitchenAid is a little slower than a dedicated grinder, but does a very good job for sausage making on batches up to 10 or 15 lbs. It has the added advantage of not needing to be clamped down (like a hand grinder does). Here are the parts of the grinder. 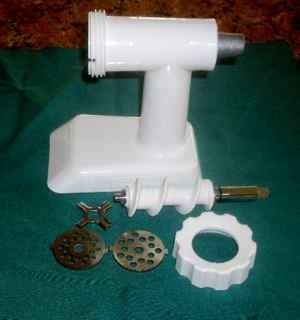 They are about the same no matter what meat grinder type you decide to use for your homemade sausage. The auger slides into the meat hopper (which is resting upside down in this picture) and attaches to the front of the mixer. The small cutting blade goes on next, followed by one of the grinding plates (I used the finer one for this batch). You can see the whole assembly put together and ready to go in the picture just before this one. Here I have already ground about 2 lbs. of my cubed pork. You can see that I am working the meat into the grinder with a pusher. You don't need to put a lot of pressure on the pusher; just make sure the meat is feeding uniformly into the auger. This is about a 7 lb. batch of sausage, and it took around 10 minutes to send the whole works through the fine grinding plate. 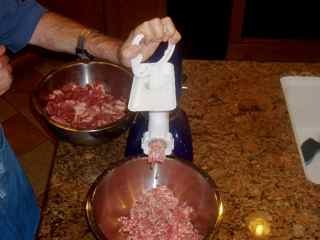 Some sausage making recipes call for the meat to be ground twice, and it goes much faster the second time through the grinder. Grinding with the larger holed plate is also a bit faster. Your meat is all ground now, and it has probably warmed up from the whole process. This is a good time to cool it down by putting it in the fridge or a cooler with some ice. Now is also the time in the homemade sausage process (while the meat is cooling) that I take everything apart, wash it up really well with soap and hot water, and move on to getting my spices measured and ready.